No conference ever goes off without a few nerve endings hanging out in the final hours before kick-off. So, we should have known the relative calm today was really a dark cloud looming overhead. Sylvain Grand’maison had to unexpectedly cancel. And, before you get all mad at Sylvain, you have to understand that PAB courses through Sylvain’s body. It couldn’t have been an easy decision for him. 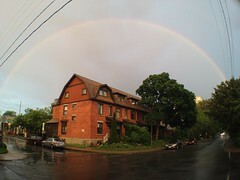 Just like the short downpour we experienced here in Ottawa last night, a perfect double-rainbow all-the-way has arched itself over PAB2012 and delivered an incredible lead-off speaker for Saturday morning. We’re honoured to have Montreal communication artist and design consultant Jason Goldsmith at the top of the order on Saturday. It’s too soon to have the exact title and description of the talk so we’ve tentatively called the session The Big Blue Hug, a name taken directly from a painting by Jason’s son Ellis. Ellis has Autism. The Big Blue Hug opened up a new world of communication between Jason and Ellis, giving a visual voice to Ellis who is unable to speak. A downloadable program will be available shortly.